I love a good smoothie! Yes, I know there are so many good ones out there!! But this one is super yummy. It’s my go to smoothie because it’s so simple. Everyone loves this smoothie and I’ll tell you why. Yep, there is a secret and I’ll tell you what it is. It’s the frozen banana. Have you ever had a frozen a banana? Ok, it’s fabulous. It tastes like frozen vanilla ice cream. 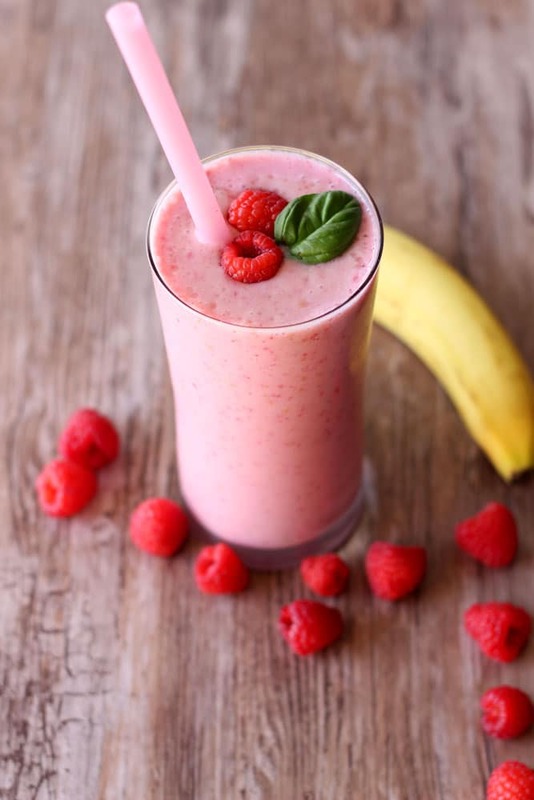 When making this smoothie, I always use a frozen banana and fresh raspberries. You can use frozen raspberries, but I can really taste that freshness when using fresh. This one is so easy to make….just a few simple ingredients and you’re all set. Pop them in your blender, puree until smooth and top with some fresh mint and MAN! Yumminess right there!! This one is gluten free and perfect for those warmer days. The kiddos are going to love this one…but the adults love it just as much! Makes about 1-2 servings. Happy drinking! Add all ingredients to a blender. Puree on low and then move to high speed until smooth. Top with fresh raspberries and a sprig of mint and enjoy immediately. This smoothie looks fantastic, and I’m sure it will taste as good as it sounds. I need to try this one morning, for sure! Over here the weather’s gone mad, over 40 degrees C in the shade. 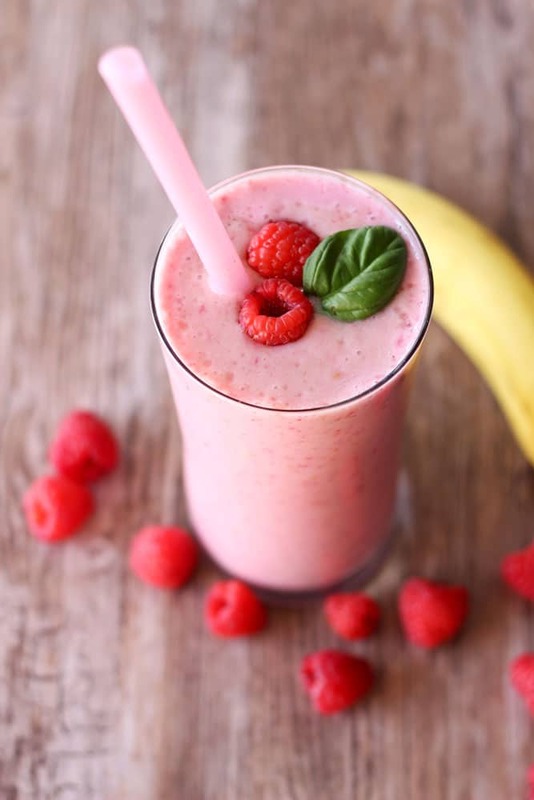 Your smoothie would be just perfect, banana and raspberries are always a good combination. I also like the addition of yogurt, it gives the drink a lovely creamy texture. Very nice! I’m going to freeze bananas, immediately. What do you think about basil instead of mint, could it work? Absolutely! Basil would be a perfect added taste instead of mint! I grew up with my mom making us banana smoothies. She was trending way back then and didn’t know it! 🙂 I love your addition of the raspberry, it is Grumpy’s favorite! Thanks!! I love adding the banana especially when it’s frozen! The perfect breakfast smoothie! 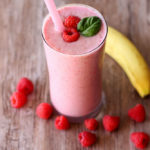 I love refreshing smoothies in the morning, they give energy and they’re very delicious!